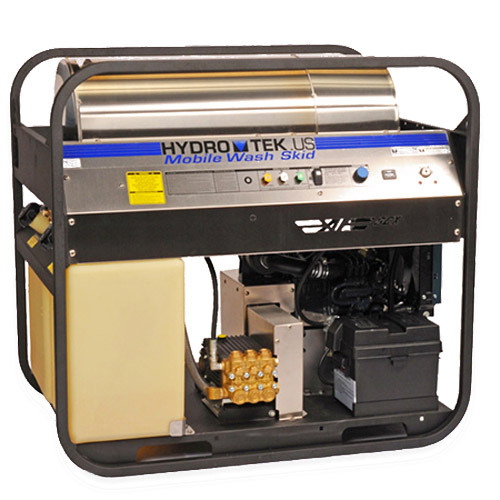 Hydro Tek SC-X Series Hot Water Pressure Washer is Diesel Powered and Diesel Heated for heavy duty industrial cleaning. The SC-X Series Hot Water Pressure Washers are self-contained Mobile Wash Skids designed with the extreme duty user in mind and includes extra features to make it suitable for use in harsh and remote environments. The SC-X is designed for extra duty industrial use. It is self-contained and requires no outside power. It utilizes larger gasoline or diesel engines and pumps than our “SC” and “SS” series washers for tackling the biggest jobs with higher water volume. High pressure, hot water spray is generated on demand by the diesel fired burner so you can achieve the best cleaning results on grease and grime anywhere your job requires. An extra-large, rugged, powder-coated steel frame surrounds the entire machine protecting its vital components. This Pro-Tect-It chassis has 4-way forklift access as well as built in lifting eyes so the machine can be top lifted with a harness or crane and the eyes double as tie down points for safe transportation. Each frame has double wall steel engine mounts to absorb engine vibration for smooth performance and includes mounting holes to hold optional stainless hose reels. The 12v burner uses dependable PowerLight technology for maximum burner performance and efficiency, heating quickly, up to 250°F, to efficiently clean extra tough grime. No outside power source needed. Heavy duty, multi cylinder diesel engines are water cooled and include oil filtration and electric key start. A side mount muffler prevents water ingress and reduces engine vibration. Panel mounted engine condition indicator lights to monitor your engine temperature & oil pressure. High torque, V-belt driven pump, low RPM, cooler and quieter operation for continuous duty performance. EZ Align™ belt tensioning system allows for easy, single bolt, belt tensioning adjustments. Heavy duty, “roto-molded”, rust free fuel tanks with frame mounted, water separating fuel filter to protect against contaminated fuel. Large fuel tanks extend run time, eliminating interruptions to refuel. Burst disc technology, pressure and flow switches, high limit thermostat, and pressure relief valve for operator safety Adjustable thermostat up to 250ºF, hour meter, and lighted on/off switches are panel mounted for easy operator access. Heavy duty gun and wand with nozzle storage, heavy duty 50’ hose, quick release nozzle set, snap close battery box. Mine Specifications: Additional features for SCX30005-MS: 8 gallon float tank with low water shutdown, GeniSys flame-out safety control system for the burner, locking battery isolator switch, extended stainless front panel, emergency stop button, stainless drip/drain pan, total relief unloader. Pump, engine, drive & heater coil are operated 25% less than max. ratings for prolonged life.